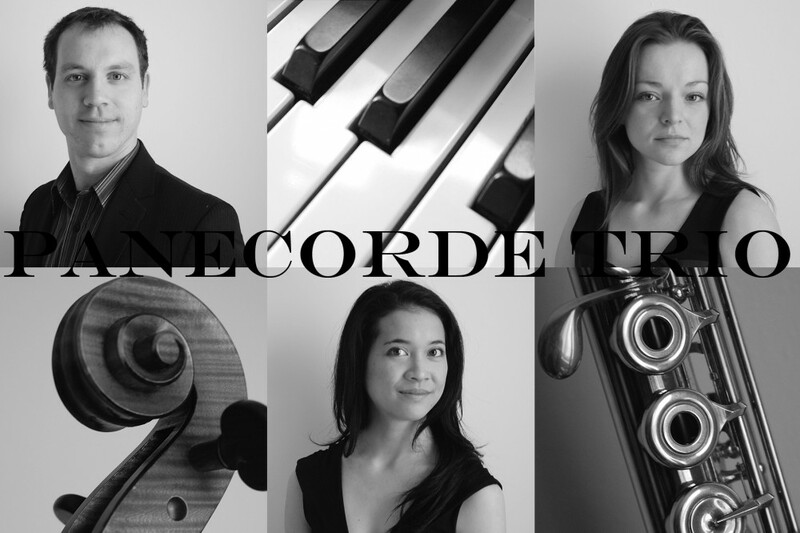 Panecorde Trio was formed in 2012 by Nadia Sparrow, Flute, Dominic Painchaud, Cello and Perri Lo, Piano. Born in Quebec City, Dominic Painchaud earned a Master’s Degree in performance from the Schulich Music School of McGill University as well as a Prix du Conservatoire de Musique du Québec(CMQ) in cello and chamber music. Laureate at the 2009 National Music Festival in Saskatoon, he has been awarded scholarships by institutions such as the Domaine Forget, the Accademia Musicale Chigiana in Siena, the Toronto Summer Music Festival and the McGill University where he recently obtained an Artist Diploma under Matt Haimovitz. He also benefited from the teachings of renowned masters such as Walter Joachim, Timothy Eddy, Desmond Hoebig, Roland Pidoux, Philippe Muller, Etienne Péclard and Antonio Meneses. Dominic Painchaud has played many times with the Quebec Symphony Orchestra for radio and television broadcast concerts and performed as a chamber musician in France, Canada and the USA. He was also heard as a soloist with the CMQ Symphony Orchestra at the Grand Théâtre in Quebec City in 2002. As a member of the Uccello ensemble, he recorded on the album Meeting of the Spirits, nominated for Best Classical Crossover Album on the 2011 Grammy Awards, under the Oxingale Records label. More recently they recorded, at the Skywalker Sound studio in California, for an album that will feature signers Sylvan Sanford and Daniel Taylor. In 2009, Dominic founded the Geistrio with violinist Ewald Cheung and pianist Maria Fuller. Together they took part twice in the Fischoff National Chamber Music Competition in South-Bend, Indiana. They also went to Austria in June 2012 to study at the Mozarteum Universität with Wolfgang Redik and played in the Salzburger Kammermusik Festival. Dominic also pursues a career as a non classical musician. Since 2008 he has regularly shared the stage with the Juno nominated jazz pianist John Roney and French Canadian singer Natalie Choquette and recorded on her latest album Terra Bella. He also forms, along with his brothers and sister, the Quatuor Painchaud, winner of the 2011 Concours des arts de la scène from the Quebec Chamber of Commerce. The ensemble has performed in cities like New York, Toronto, Orlando, Chicago, Las Vegas, Paris and Nasso. They also took part twice in the Fête Nationale du Québec in front of more than 70,000 people and, in 2011 and 2012, in the New Year’s Eve celebrations in Quebec City in front of a crowd estimated at 30,000. A native of Calgary, Perri Lo began her musical exploration with respected teachers Dale Jackson and Ann Davidson. For several years, she was an active participant in theMount-Royal College Academy for Gifted Youth (Calgary), where she developed her passion for solo repertoire as well as chamber music. Continuing her studies in London, Ontario, she graduated from the University of Western Ontario in 2009 with a Bachelors in Music – Honours Piano Performance with professor Gwen Beamish, and a Minor in Mathematics. Her education then extended to Montreal where she obtained a Masters in Piano Performance in 2011, under the tutelage of professor Sara Laimon at McGill University. Throughout her music education, she has attended various summer music programs in Canada, United States, and Europe, perfecting her craft and enhancing her solo and collaborative career. Such festivals include the International Chamber Music Workshop and Festival (Weikersheim, Germany), Icicle Creek Centre for the Arts (Leavenworth, WA), and the Orford Centre of Arts Summer Academy. Her influential mentors include professional artists such as Laurentiu Sbarcea, Kyoko Hashimoto, Cécile Ousset, Anton Kuerti, Jean Saulnier, Jimmy Brière, Gil Kalish, and the Icicle Creek Piano Trio. and co-founder of the Panecorde trio since 2012. Nadia Sparrow began her musical training at the age of seven. Two years later she began her studies in flute. Nadia showed exceptional promise from a very early age and has been a consistent first place winner in music competitions across Canada. She has played for and studied with acclaimed artists such as Patrick Gallois (Paris, France), Jeannie Baxtresser (New York, U.S.A), Susan Hoeppner (Toronto, Canada), Peter Lloyd (London, England), Timothy Hutchins (Montreal, Canada), and Jim Walker (L.A. U.S.A.). At the age of 15 Nadia was awarded the Galaxie Rising Star award and competed at the Canadian Music Competition Nationals. In 2003 Nadia was awarded the prestigious Calgary Kiwanis Music Festival Rose Bowl and Rose Bowl Scholarship as well as the Austrian Canadian Mozart Society Scholarship. She was accepted into the Banff Summer Masterclass program studying under Lise Daoust and Patrick Gallois in the summer of 2003. In the summer of 2004 Nadia was invited to study at Worcester College in Oxford, England with the highly acclaimed flutist and teacher, Peter Lloyd. In 2005 Nadia was awarded third prize at the National Music Festival in Kamloops, B.C. and was awarded first prize at the Canadian Music Competition Nationals. In 2006 she placed first in the 25 and under category at the Canadian Music Competition finals. The highest mark awarded to her by the jury was 98 percent. Nadia has previously been a member of the Calgary Youth Orchestra and the Senior Academy program at Mount Royal College. She has performed with orchestras such as the Calgary Philharmonic Orchestra as both a soloist and a substitute on various occasions. From the years of 2008-2011 Nadia spent her summers performing with the Band of the Ceremonial Guard in Ottawa, Canada where from 2009-2011 she held the post of Musical Section Leader of the flute section. In the summer of 2011 Nadia was also put in the position of Assistant Band Sergeant Major in which she acted as a musical director of the ensemble, conducting the band on regular Guard Mounts and on various musical engagements in the Ottawa area. In April of 2008 Nadia graduated with a Bachelor of Music in Performance from the University of Calgary and in February of 2011 graduated with a Master of Music in Flute, Solo at McGill University under the direction of Timothy Hutchins. Nadia currently resides in Montreal, Q.C. where she performs with the chamber ensemble “Panecorde”, La Musique des Fusiliers de Mont-Royal and teaches both privately and for the McGill Conservatory of Music.